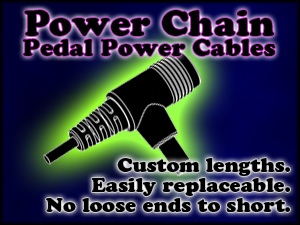 Can use one chain to add a second power plug onto an existing plug. "Instead of one long, fixed daisy-chain that flops around and shorts out because it never has exactly the right number of connectors, each link in the Power-Chain is independent: Easily replaceable, simple to add or remove, custom lengths, no loose ends. Plug in just what you need. Reconfiguration or replacement is a snap, literally."